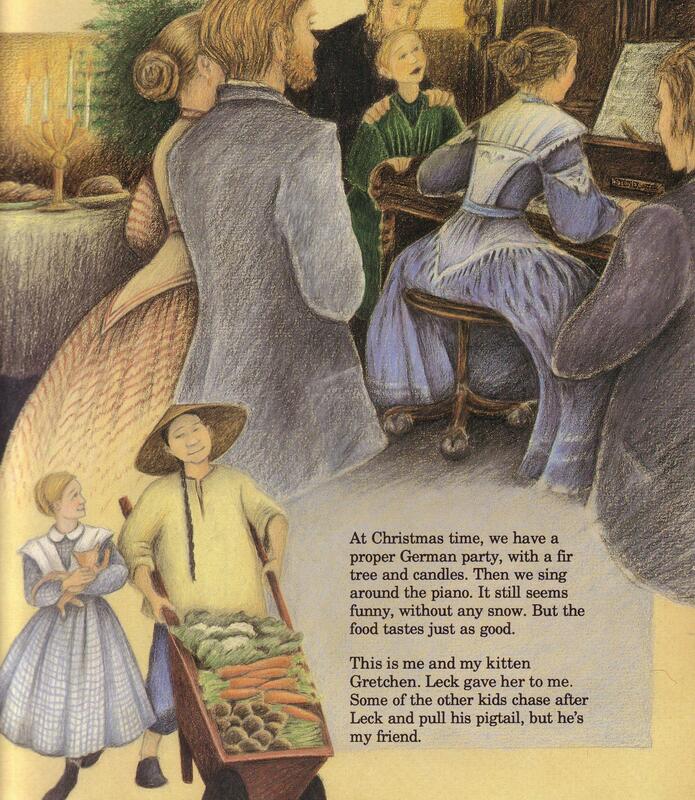 We’re sitting in the meeting area–not in the circle we use for meetings in which we all talk with each other, but in the arc facing my corner, that works better for read-aloud books with illustrations. For a larger class I would need to make a Power Point. The intimacy of leaning forward, leaning together into the world of the book, can work here. As I begin to read aloud, puzzled faces remind me that the book can be confusing. Each year, reading My Place refreshes my appreciation for the full, rich range of interests and attention styles represented among my students. I’ve learned to trust them: they’ll get it, together. There’s the kid who always notices numbers of any kind, including dates. She figures out, already on the second two-page spread, that we’re going backwards in time. “Before it was 1988, now 1978. 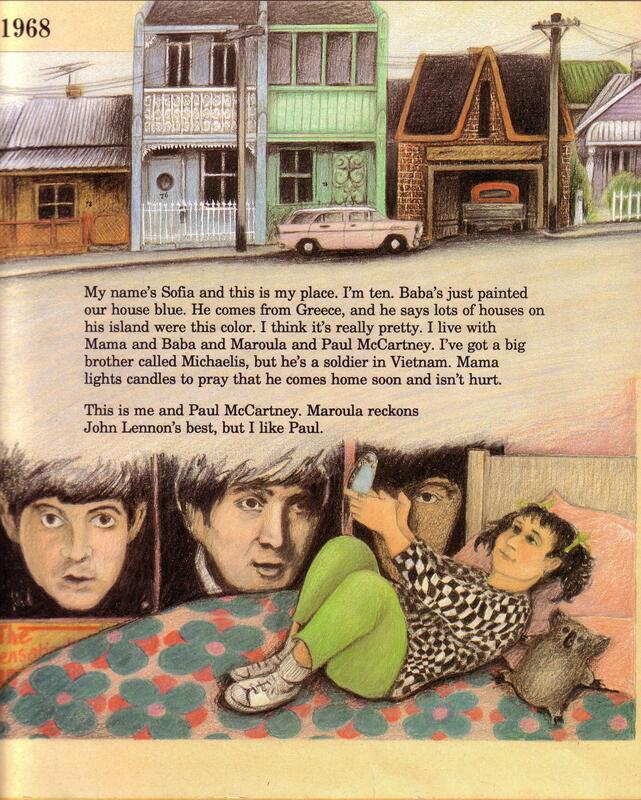 The next one will be 1968.” It is, and that year’s child narrator, Sofia, has posters of the Beatles on her bedroom wall. She writes about an older brother who’s a soldier in Vietnam. 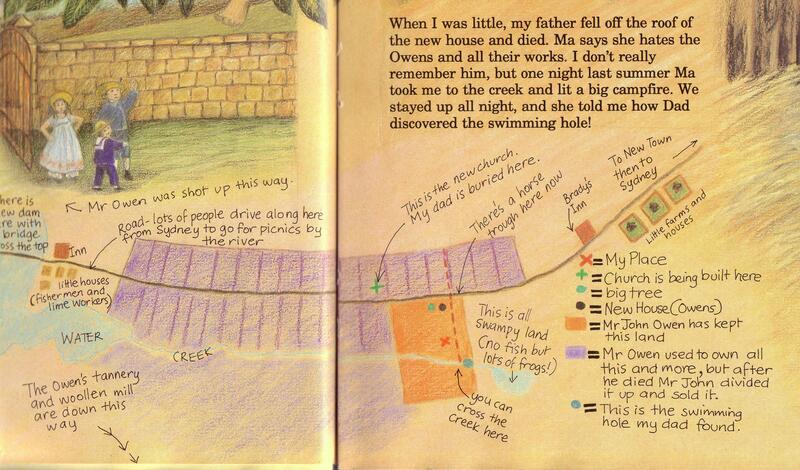 Other kids make sure I read all the labeling on each map–partly because they’ve figured out that important clues are often embedded there. Some kids are particularly able to pick up on detail in illustrations, and they’re the ones who say, “Wait! This is all the same house! Look at those railings!” Then we go back and compare, page by page: yes, yes, yes, yes. 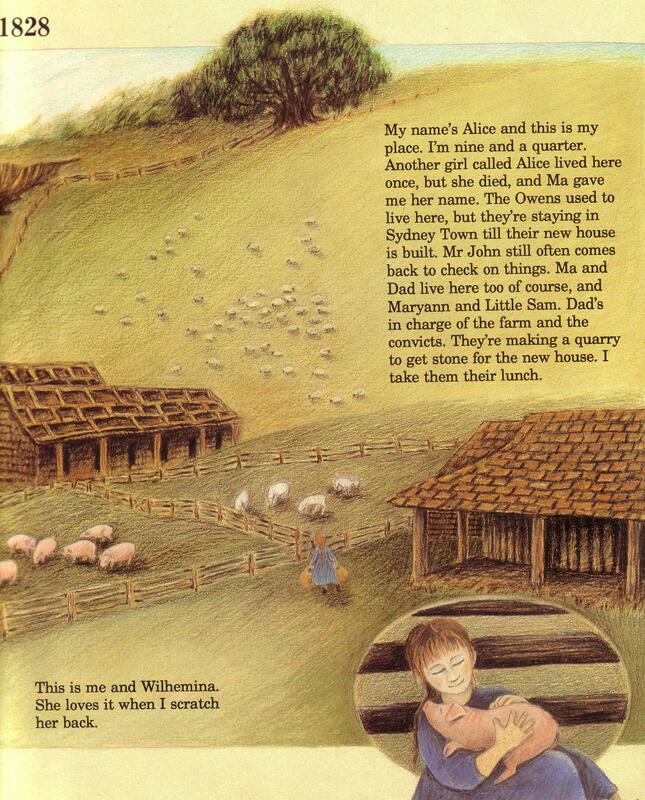 And for much of the book it is the same house–each child narrator is the right-aged child living in that place–until the house hasn’t been built yet, and we’re with the sheep and pigs, on that hillside, below the big tree, above the bay and creek. In every class, some kids will have unerring radar for family relationships, They’re the ones who first point out that Sofia in 1968 is the unwelcome baby sister in 1958; or that the Miss Miller who is almost 90 in 1948 is the zippy aunt with the bicycle in 1898, and also the nine-year-old Minna who makes friends with a Chinese immigrant vegetable farmer in 1868. By 1798, almost the end of the book, everyone has learned to follow these connections through the book’s strangely inverted time. 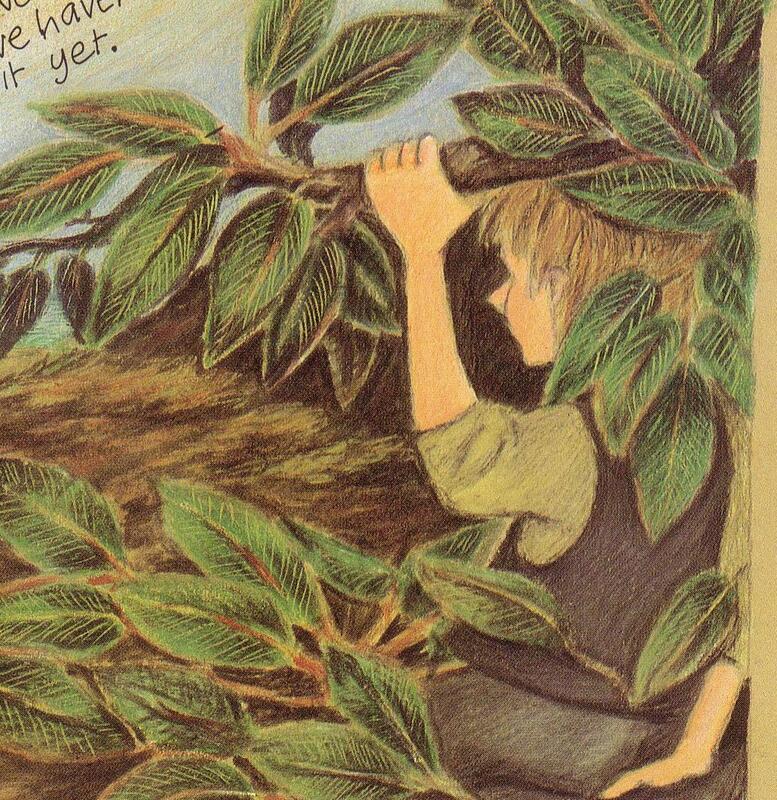 When 11-year-old Sam, indentured convict laborer, climbs up into the big tree and pretends that he can see all the way to Shoreditch and his mother and sisters and brother, the class grows even quieter. They know that he will become the Sam remembered in 1838 by one of his children, the father who has fallen off the rich landowner’s roof, and died. I don’t want to tell about the actual ending of the book; I want you to go find it and read it, and join all of us in the complicated feelings it generates. 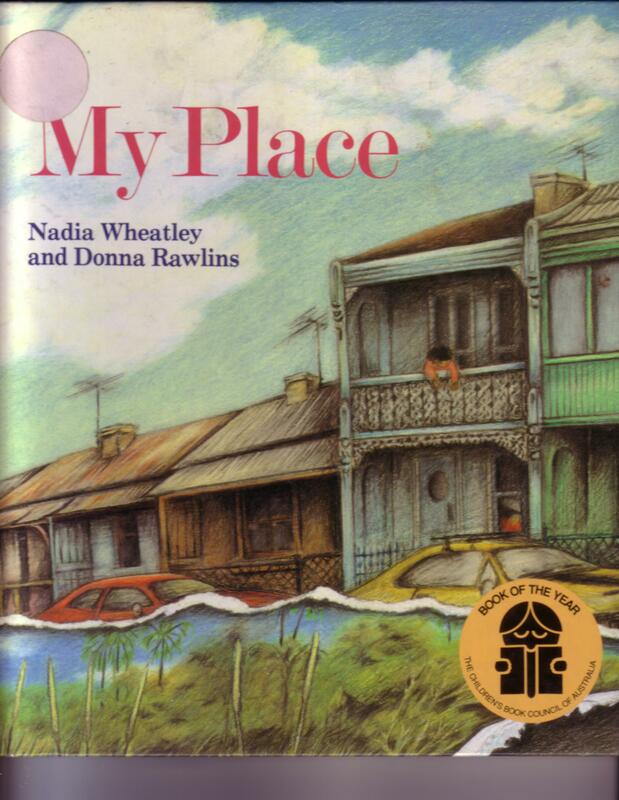 Nadia Wheatley and Donna Rawlins were also doing place-based education before it was named that. 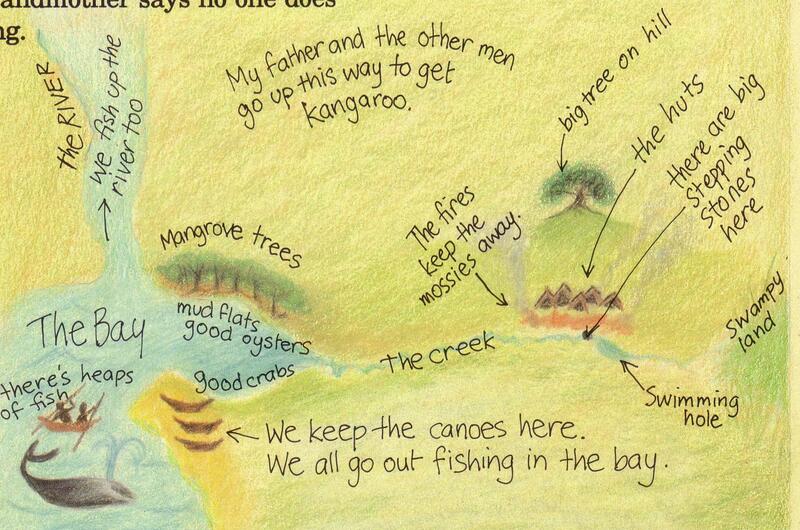 Clearly, they created My Place to help Australian kids know more about their country, and to encourage those kids to know their own local and particular places, their personal equivalents of the big tree that is a landmark for every one of the child narrators, or the canal that was once a creek, or the ridge where the main street was once a footpath. Because there are so many narrators, the place itself assumes unusual importance. I’ve always been fascinated that their book’s strategy works for American kids, too. Immersion in this other place encourages kids to notice their own places, and I’ll write more about that in a future post. It seems to me that Wheatley and Rawlins must have wanted something else, too: they wanted to show their narrators experiencing the local versions of big picture history: the pros and cons of the immigration experience; the hurt of economic injustice and waves of joblessness; the recurrent mercilessness of war, and the injuries and losses and dislocations left in wars’ wake; the environmental impacts of economic development, as we travel back to a time when it was actually safe to swim in the creek. But also kids’ perennial delight at new technologies: streetlights! personal automobiles! television! 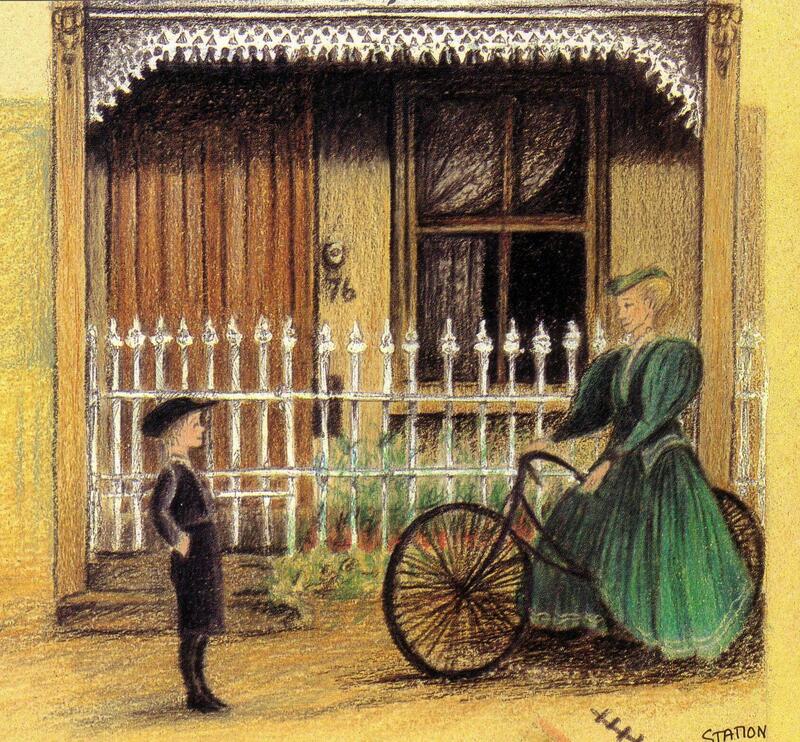 Within all that big picture stuff glimpsed small and made real, Wheatley and Rawlins have shown us each child narrator’s way of assembling and creating his or her own experience out of what is available. We see all the different reasons for perching or hiding in the big tree. We see the comfort children find in animals, and the things that can be learned about each child’s adults from the parties they throw. Always, in each new older time opened out for us, something has been lost; always, something has been gained. Each child narrator exists within the river of time, which gives and takes away. The book itself, its spirit, becomes that river, revealed to us in a special way by the authors’ device of making it flow backwards. For just a minute, I want to address directly all those years’ worth of kids sitting in a series of meeting areas together, taking up the book’s back-cover challenge: THIS BOOK IS A TIME MACHINE! Again and again, you showed me details and connections I would have missed by myself. But also, in the deep and brave way you experienced the book and its place and world, you helped me feel what it all meant, and for that especially I thank you. 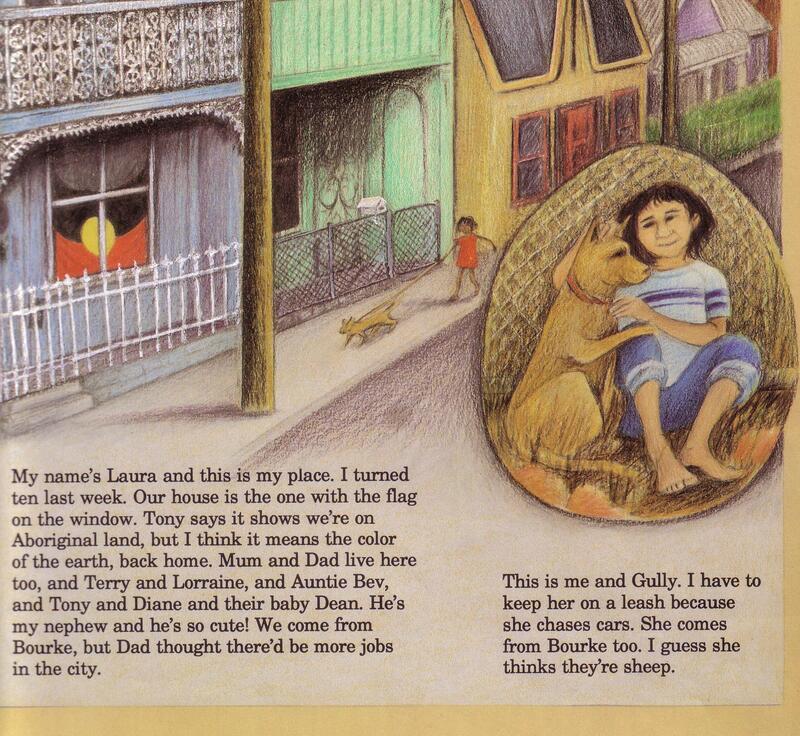 There’s more to this story: the book’s wonderful success in Australia, and its transformation into a video series, brilliantly updated to the present; one class’s decision to make a spin-off book called Our Places. For various reasons, I’m saving those things for another time. 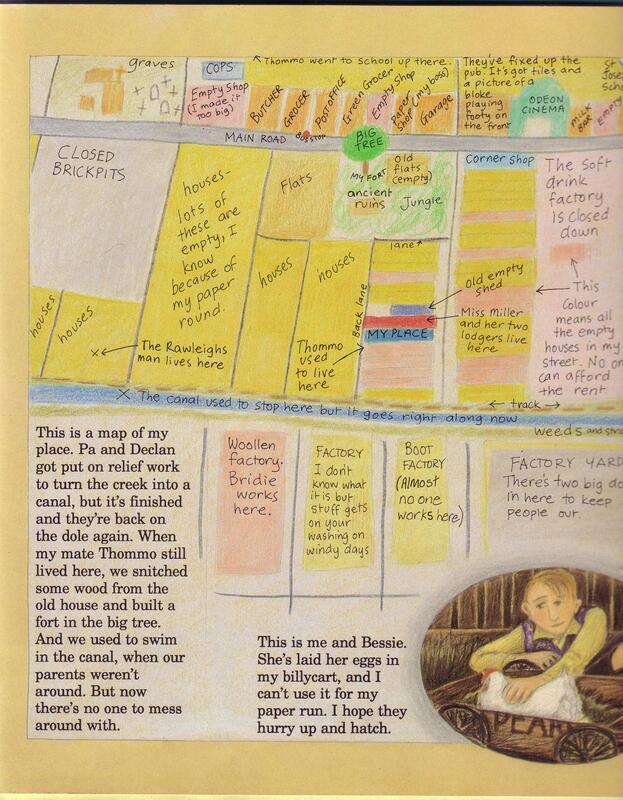 This entry was posted in Class life, Place-based education, Reading and writing, Technology and tagged classroom community, David Sobel, Donna Rawlins, economic history, environmental history, immigration, My Place, Nadia Wheatley, place-based education, progressive education, reading aloud to young adolescents, war in children's literature by pollybrown2013. Bookmark the permalink. Yes. Emphatically. And hooray for the poems that prove it!